This week I’m thrilled to welcome a fellow Northern Californian Jeanne (pronounced like Barbara Eden’s old 70s TV show “I Dream of Jeannie.” Except there is no “I”) Marcella to my Scribbles page and introduce you all to her and her amazing writing. I can’t wait to jump in so let’s get to it. Welcome to my Scribbles Page Jeanne. You know people are not going to have to Google the TV Show reference right? Probably, maybe you should include a link for them. (Laughs) Nah, they’re a smart group they can figure it out. First things first, tell me about your writing. Dark fantasy is my main genre to play in, with urban fantasy quickly gaining favor. I write about the human condition and its struggles, even if most of my characters are not human. To me, that’s not only great drama and character development, it’s the great foundation for action and tension. I agree. I love using non-human character to explore human nature. It’s fun. So, how did you get started? What drives you to sit at the keyboard and put word to paper? Even before I learned to write, I was drawing. And as far back as I can remember, I’ve always been telling stories and demanding to hear them. The children’s author, Richard Scarry, really sent my imagination into overdrive when I was small. I was completely obsessed with his books back then, and I’m still thoroughly fascinated by his ability to tell stories within stories within stories. Another early influence that probably shaped my writing into the dramatic was watching soap operas back in the 80s with my grandmother. Stop! I have to know what soaps did you watch? (Laughs.) Now that I think about it, my first exposure to soaps was with my mom. She watched “Mary Hartman, Mary Hartman”, and another one later simply called “Soap”. Although I do recall both shows being really bizarre--I think “Soap” did a Rosemary’s baby scenario. It was confusing back then. With my grandmother it was “Days of Our Lives” and “Another World.” I still remember the DooL opening…. “Like sands through the hourglass….these are the days of our lives!” It was all very dramatic. Okay, sorry didn’t mean to sidetrack I just had to know, please continue. No problem. Anyway, it’s the characters that live in my head that drive me to write. Their relationships and hardships, their agony. I can’t shut them up, even when I sleep. While we’re talking about characters please give us some insight into your Main Character. Who are they? What is their life about? Acanthus Breese is a twelve and a half year old boy, but this is definitely not a YA series. This is a gritty dark fantasy that lets the reader discover most of the plot as the main character does. Oh, I like that. I hate when you know everything at the start. Yep, that’s why I did it this way. 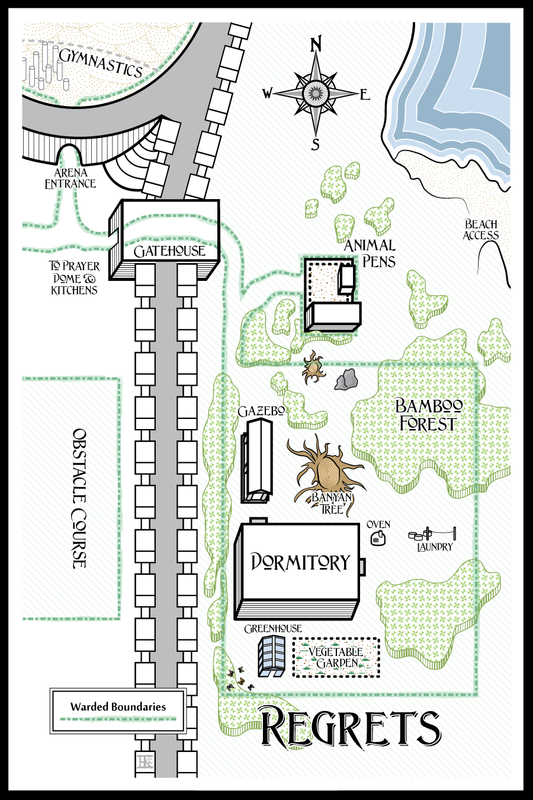 So, Acanthus and his peers have been imprisoned and abandoned by the adults; they’ve raised themselves since they were five. Acanthus is the smallest boy in the Regrets grid and is often picked on. He draws, carves toy animals, and prays to the goddess to help him retain his sanity. He and the other boys endure while waiting for forgiveness, even though they aren’t exactly sure what they did wrong. Wow, that is dark. Should be a great read. I hope so. I hope readers enjoy it. Let’s change topic a bit, if you don’t mind. What are your ambitions for your writing career? Ambitions? Well, just to tell a good story and have people enjoy the characters as much as I do. I love it. For me that is the best answer possible. I have to know, where do your ideas come from? That’s a really loaded question. (chuckles). I consider myself a chaotic thinker. My ideas come from everything and everywhere. I can’t turn it off. I see multiple and completely different stories within movies, TV shows, and even just looking out the window. My head is so crowded with ideas and input it’s often a trial to juggle them into submission. Again, it could be that Richard Scarry influence. I think a lot of writers are the same. I know I have similar issues. I think it’s part of the creative process. Or, a sign of madness. Not sure which. (Laughs) You may be on to something there. What is the hardest thing about writing your book? 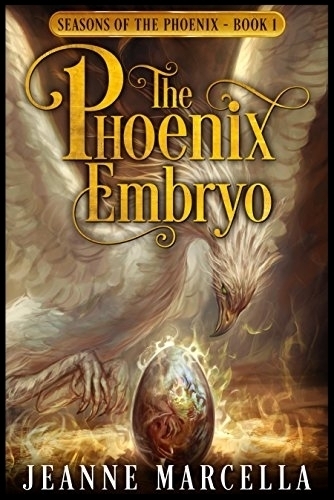 The hardest thing about writing ‘The Phoenix Embryo’ was wading through all his trials that had piled up as I wrote, and ironing out the order they fell in. It was a very frustrating process that took about a decade. Wow. That had to be tough, but you did it. Congratulations. Can you tell me, what are the challenges/benefits to being a self-published author? Finding a readership and getting noticed is certainly a major hurdle, and I’m still floundering on that particular challenge. I’ve done my research, and know the avenue I need to go, it’s just taking that deep breath and navigating it. The benefits are the best. Complete creative control, and having it in the reader’s hands not long after the editors and formatters finish with it. I love the idea of complete creative control, but I get that has its challenges too? It can, but it’s so much fun. I love it. Awesome. Now back to the writing process. Did you come across any specific challenges when writing? What did you do differently the next time? There are a few. Realizing that I’ve written two, sometimes even three books as one. It’s happened a few times, and in more than one series/genre. Discovering that I wrote my ‘Infinity 8’ series backwards--starting in modern day when it needed to begin in the early 1900s. Creating an outline and a synopsis has really saved me time, and a lot of headaches. I push the ideas as far out as they’ll go, and examine them in detail as that particular idea grows closer. (Laughs) It’s less chaotic that way, and I get things done quicker. Organization and outlines are definitely the way to go. I agree. As a self-published author, I’m curious, where do you see publishing going in the future? Ebook distribution is going to change somehow, of course. The question is just when. The tech industry doesn’t stand still. And with Amazon being such a powerhouse, the publishing industry may finally wake up and start competing. Perhaps the remaining Big 5--is it still the Big 5? Will ban together and open their own bookstores and online platform. That would be really neat. Now that would be an interesting idea. I think someone needs to compete with Amazon or they will end up controlling the industry. Sadly, I have one last question for you. It always goes fast. Maybe, we could do another interview at some point. Okay, so final question, what do your fans mean to you? Fans provide the mental energy that keep characters, and even a series alive. When they contact you to say how much they enjoy a book, it’s a treasure, and an honor. And on that finale note, I want to thank you for stopping by and agreeing to do this. You were a joy to chat with. Stories came to me from a very young age. And I loved books. I would stare at Richard Scarry’s art for hours. Days. And was mesmerized at the infinite mini universes and stories within stories presented. The music I grew up with truly varied. A few examples: Mexican, Hawaiian, and big band. Classical and top 50s and 60s. In the mid-80s I encountered the new age genre: Ray Lynch’s Deep Breakfast. Stevie Nicks was my all time favorite for her unique fantasy-like allure. Today I gravitate toward Apocalyptica, Adam Hurst, and E.S. Posthumus. I’m also into old black and white movies. People knew how to tell a complete story back then with only body language and a look. I often muse why centaurs are categorized as non-people or stupid animals, instead of treated like the other sentient mythical beings of vampires, werewolves, and demons. Conspiracy theories are my soap operas. Paranormal realms and ancient astronauts. Is the moon really hollow? Is Bigfoot from another dimension or merely a shy, near-extinct descendant of Giganthropithicus Blacki? All this drives the imagination and creativity. And it certainly opens up new realms to play in. You can find Jeanne here and on Twitter here. She also, has a Facebook Page here.